This species is accepted, and its native range is Indian Subcontinent to Myanmar. Annual. Culms erect, or geniculately ascending; 20-100 cm long. Culm-internodes distally glabrous, or pubescent, or hispid. Culm-nodes glabrous, or pubescent, or bearded. Leaf-sheaths hispid. Ligule a ciliate membrane; 1.5-3 mm long. Leaf-blades 10-20 cm long; 6-15(-20) mm wide. Leaf-blade surface glabrous, or pubescent, or hispid. Inflorescence a panicle. Panicle contracted; obovate; nodding; 5-10(-20) cm long. Panicle branches glabrous in axils; with insignificant pulvini. Spikelets solitary. Fertile spikelets pedicelled. Spikelets comprising 1 basal sterile florets; 1 fertile florets; without rhachilla extension. Spikelets elliptic, or ovate; dorsally compressed; compressed slightly; 4.5-5 mm long; persistent on plant. Glumes similar; reaching apex of florets; thinner than fertile lemma. Lower glume ovate; 0.5-0.75 length of spikelet; membranous; without keels; 5 -veined. Lower glume apex acute, or acuminate. Upper glume ovate; 1 length of spikelet; membranous; without keels; 7-11 -veined. Upper glume apex acute, or acuminate. Basal sterile florets barren; with palea. Lemma of lower sterile floret similar to upper glume; ovate; 1 length of spikelet; membranous; 7-11 -veined; acute, or acuminate. Fertile lemma oblong; dorsally compressed; 3-3.5 mm long; indurate; yellow, or dark brown; shiny; without keel. Lemma margins involute. Lemma apex obtuse. Palea involute; indurate. Europe: central, southwestern, southeastern, and eastern. Africa: north, Macaronesia, west-central tropical, southern tropical, and western Indian ocean. Asia-temperate: Siberia, Soviet far east, Soviet Middle Asia, Caucasus, western Asia, Arabia, China, Mongolia, and eastern Asia. Asia-tropical: India, Indo-China, and Malesia. Australasia: Australia and New Zealand. Pacific: northwestern and north-central. North America: western Canada, eastern Canada, northwest USA, north-central USA, northeast USA, southwest USA, south-central USA, and southeast USA. South America: Caribbean, northern South America, Brazil, and southern South America. Cultivada en Colombia; Alt. 1000 - 1500 m.; Andes. Panicum miliaceum var. densobrunneum Agaf. 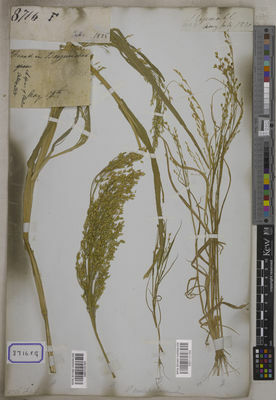 Panicum miliaceum var. ruderale Kitag. 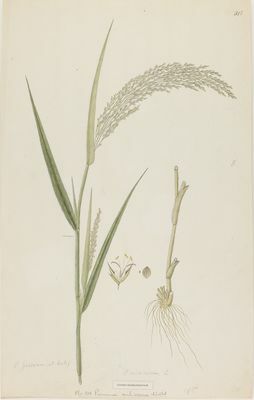 Panicum miliaceum var. subvitellinotephrum Agaf. Panicum provinciale É.Huet & Chamb. Engelmaier, P. & Wilhalm, T. (2018). Alien grasses (Poaceae) in the flora of the Eastern Alps Neilreichia 9: 177-245. Parslow, R. & Bennallick, I. (2017). The new flora of the Isles of Scilly: 1-539. Parslow Press. Cossu, T.A, Camarda, I. & Brundu, G. (2014). A catalogue of non-native weeds in irrigated crops in Sardinia (Italy) Webbia; Raccolta de Scritti Botanici 69: 145-156. Acevedo-Rodríguez, P. & Strong, M.T. (2012). Catalogue of seed plants of the West Indies Smithsonian Contributions to Botany 98: 1-1192. Giraldo-Cañas, D. (2011). Catálogo de la familia Poaceae en Colombia Darwiniana 49: 139-247. Onana, J.M. (2011). The vascular plants of Cameroon a taxonomic checklist with IUCN assessments: 1-195. National herbarium of Cameroon, Yaoundé. Edgar, E & Connor, H.E. (2010). Flora of New Zealand, ed. 2, 5: 1-650. R.E.Owen, Government Printer, Wellington. Clayton, W.D. & Snow, N. (2010). A key to Pacific Grasses: 1-107. Kew Publishing, Royal Botanic Gardens, Kew. Kandwal, M.K. & Gupta, B.K. (2009). An update on grass flora of Uttarkhand Indian Journal of Forestry 32: 657-668. Grubov, V.I. (2008). Key to the vascular plants of Mongolia (with an atlas) 2: 1-503. Academy of Sciences, Mongolian People's Republic, Ulaan Bator. Cope, T.A., Knees, S.G. & Miller, A.G. (2007). Flora of the Arabian peninsula and Socotra 5(1): 1-387. Edinburgh University Press. Takhtajan, A.L. (ed.) (2006). Conspectus Florae Caucasi 2: 1-466. Editio Universitatis Petropolitanae. Danin, A. (2004). Distribution Atlas of Plants in the Flora Palaestina area: 1-517. The Israel Academy of Sciences and Humanities, Jerusalem. Kress, W.J., DeFilipps, R.A., Farr, E. & Kyi, D.Y.Y. (2003). A Checklist of the Trees, Shrubs, Herbs and Climbers of Myanmar Contributions from the United States National Herbarium 45: 1-590. Germishuizen, G. & Meyer, N.L. (eds.) (2003). Plants of Southern Africa: an annotated checklist. Strelitzia 14.: i-vi, 1-1231. National Botanical Institute, Pretoria. Malyschev, L.I. & Peschkova, G.A. (eds.) (2001). Flora of Siberia 2: 1-362. Scientific Publishers, Inc., Enfield, Plymouth. Noltie, H.J. (2000). Flora of Bhutan 3(2): 457-883. Royal Botanic Gardens, Edinburgh. Fedorov, A.A. (ed.) (1999). Flora of Russia. The European part and bordering regions 1: 1-546. A.A. Balkema, Rotterdam, Broekfield. Boggan, J. Funck, V. & Kelloff, C. (1997). Checklist of the Plants of the Guianas (Guyana, Surinam, Franch Guiana) ed. 2: 1-238. University of Guyana, Georgetown. Wood, J.R.I. (1997). A Handbook of the Yemen Flora: 1-434. The Board of Trustees of the Royal Botanic Gardens, Kew. Lee, W.T. (1996). Lineamenta Florae Koreae: 1-1688. Soul T'ukpyolsi: Ak'ademi Sojok. Dassanayake (ed.) (1994). A Revised Handbook to the Flora of Ceylon 8: 1-458. Oxford & IBH Publishing Co. PVT. LTD., New Delhi, Calcutta. MacKee, H.S. (1994). Catalogue des plantes introduites et cultivées en Nouvelle-Calédonie, ed. 2: 1-164. Museum national d'histoire naturelle, Paris. Davis, P.H. (ed.) (1985). Flora of Turkey and the East Aegean Islands 9: 1-724. Edinburgh University Press, Edinburgh. Kharkevich, S.S., Probatova, N.S. & Novikov, V.S. (1985). Sosudistye rasteniia sovetskogo Dalnego Vostoka 1: 1-383. Izd-vo "Nauka," Leningradskoe otd-nie, Leningrad. Meikle, R.D. (1985). Flora of Cyprus 2: 833-1970. The Bentham-Moxon Trust Royal Botanic Gardens, Kew. Tutin, T.G. & al. (eds.) (1980). Flora Europaea 5: 1-452. Cambridge University Press. Walker, E.H. (1976). Flora of Okinawa and the southern Ryukyu islands: 1-1159. Smithsonian Institution Press, Washington D.C., U.S.A.
Bor, N.L. (1968). Flora of Iraq 9: 1-588. Ministry of Agriculture & Agrarian Reform, Baghdad. Marhold, K. (ed.) (2012). IAPT/IOPB chromosome data 13 Taxon 61: 889-902. Marhold, K. (ed.) (2012). IAPT/IOPB chromosome data 14 Taxon 61: 1336-1345. Sheremetova, S.A., Ebel, A.L. & Buko, T.E. (2011). Supplement to the flora of Kemerovo region since 2001 till 2010 Turczaninowia 14(1): 65-74. Boulos, L. (2005). Flora of Egypt 4: 1-617. Al Hadara Publishing, Cairo. Koyama, T. (1987). Grasses of Japan and its neighboring regions: an identification manual: 1-570. Kodansha, Tokyo, Japan. Fosberg, F.R. (1957). The Maldive islands, Indian Ocean Atoll Research Bulletin 58: 1-37. Ovczinnikov, P.N. (ed.) (1957). Flora Tadzhikskoi SSR 1: 1-547. Izd-vo Akademii nauk SSSR, Moskva. Roshevitz, R.J. & al. (eds.) (1950). Flora Kirgizskoi SSR 2: 1-315. Frunze : Izd-vo KirgizFAN SSSR. Merkodovich, N.A. (ed.) (1941). Flora Uzbekistana 1: 1-566. Izd-va Akademii nauk Uzbekskoi SSR, Tashkent. Hubbard, C.E. & Vaughan, R.E. (1940). Grasses of Mauritius and Rodriguez: 1-128. Crown Agents for the Colonies, London. Fedtschenko, B.A. & al. (1932). Flora Turkmenii 1: 1-340. Turkmenskoe gosudarstvennoe izd., Ashkhabad. Camus, E.G. & Camus, A. in H. Lecomte (1922). Flore Générale de l'indo-Chine 1(3): 193-336. Voeltzkow, A. (1917). Flora und Fauna der Comoren: 428-480.